Introduction: H2OCalc is a hydrology and hydraulics calculator sold by Innovyze that has many of the equations and calculation methods used in InfoSWMM, ICM and SWMM5. This is the H2OCalc information for the Weir Equations. A sharp-crested weir is a vertical plate placed in a channel that forces the liquid to flow through an opening to measure the flow rate. The type of the weir is characterized by the shape of opening. 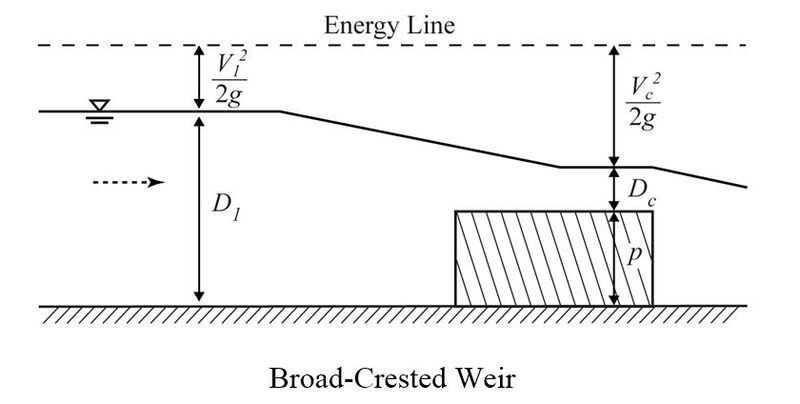 A vertical thin plate with a straight top edge is referred to as rectangular weir since the cross section of the flow over the weir is rectangular (see the following figure). typically given as 1.84 in SI, 3.33 in English. A multiple step weir is a rectangular weir with stepwise increase in length along the weir height. It helps to maintain low velocity across the weir during low flows and may be ecologically friendly as it allows fish freely pass across the weir. Notice that L is measured along the bottom of the weir (called the crest), not along the water surface. With low flow rate, it is common to use a V-Notch weir (shown below). C = the flow coefficient that typically range between 0.58 and 0.62. The most commonly used value of the notch angle θ is 90o; for this case (i.e., θ is 90o), C is found to be around 0.585.
n = exponent, 1.5 for rectangular and Cipolletti weirs, 2.5 for a triangular weir. If the weir is long in the direction of flow so that the flow leaves the weir in essentially a horizontal direction, the weir is a broad-crested weir. C = the flow coefficient that typically range between 2.4 and 3.087. The flow coefficient C can be obtained from the following figure. Depending on the shape of the weir and head on the weir, the C value may range from 2.4 to 3.1. Any other type of weirs can be modeled as generic weir using the following equation. The weir coefficient value depends on the weir type, and is the function of the head above the weir crest. How does SWMM handle the contracted weir equation when increasing H drives the result to zero?